Time and again I have been wanting to use a krul/krulletje in my documents. For instance in proofs consisting of multiple parts, as an alternative \qedsymbol, etc. But never could I find one. I personally consider the first one sloppy and the second one desireable. But this is of course a very unofficial and hanwaving definition of what the krul should actually look like. I bet there will also be people who prefer the first type. A short example of the krul in use can be seen here. Using Drawing on an image with TikZ, I took your "desirable" krul symbol and drew on it until I had something that looked fairly similar. I used the hobby package to define the béziers rather than fiddling with control points (to avoid recomputing the path each time the symbol is used, I used a nifty feature of the hobby package that allows for reuse of a hobbily defined path; a bit of box magic puts the definition at the start of the document without - I hope - taking up any space). The key feature of this implementation is the use of the calligraphy package to style the lines. This, in my opinion, makes it look more like a letter drawn with a pen than a squiggle. For added bonus, I made it scale according to the fontsize. The marvosym package has a symbol called \Denarius. The package documentation says, "The \Denarius symbol is also known as the correction sign “Deleatur”." The deleatur (https://en.wikipedia.org/wiki/Dele) is a proofreading symbol that would seem to be the counterpart to "stet". In fact, the topic of the correspondence of deleatur and krul was discussed at our sister website https://graphicdesign.stackexchange.com/questions/58320/what-is-the-name-or-unicode-for-this-symbol-similar-to-%E2%82%B0-dutch-called-krul, as some of the answers allude to. Below I show it as given, and then two clipped versions, as some might not like the extra curl. \krulA, \krulB, or this \krulC. The German wikipedia, https://de.wikipedia.org/wiki/Deleatur, says that the symbol has a unicode of U+20B0, though I have not yet found a font that contains it. However, the German rendition is not quite the same as shown above. I created the symbol using tikz. I chose to scale the krul to about a letter size, but one can of course change this. I got the code via Bézier curves in Geogebra. Once I got the krul, I exported the file as tikz-code. 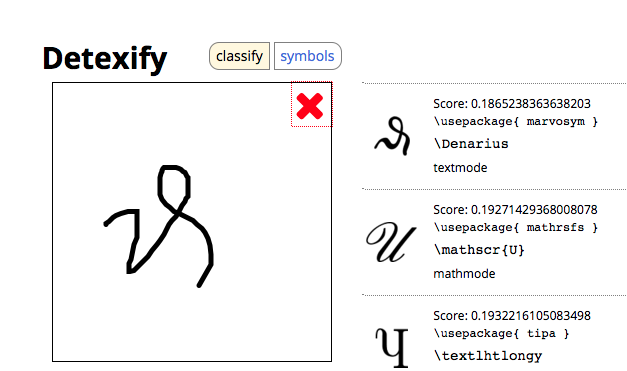 Have a look at http://detexify.kirelabs.org/classify.html, a VERY useful site! Don't know how to make this symbol! How to make this expected value symbol? How to make this symbol? How to make theta symbol? How to make this symbol (topology)?